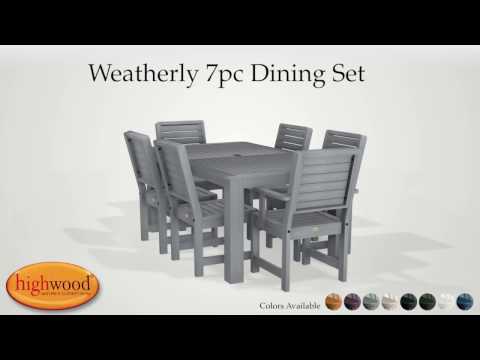 This Weatherly Dining Set features our classic 36in x 72in rectangular dining table with an umbrella hole and 6 armchairs. The Weatherly Collection's casual and inviting design provides a beautiful surround in the chairs to our sturdy and well-built table. In addition to dining in style, our material is friendly to dirt and grime so clean up is a breeze. Dining separates can also be purchased to expand your set further. The chairs have been load-tested, per ASTM 1561-03 (2008) standard for Outdoor plastic furniture and have a 500-pound weight capacity. Assembly is required (see assembly guide). Please note that this is a larger item that ships LTL. This table is the perfect addition to our patio! We absolutely love the look and quality! It just endured it's first long winter and it's still looks good as new! We can't wait to get more Highwood pieces to complete our outdoor look. These products are definitely worth the price and so easy to assemble. We were so impressed when we unboxed our order and found that our hardware was packed by adults with disabilities. Good on you, Highwood! There's a lot to feel good about with this set, especially after it was assembled. We are not very handy but the directions were easy to follow.